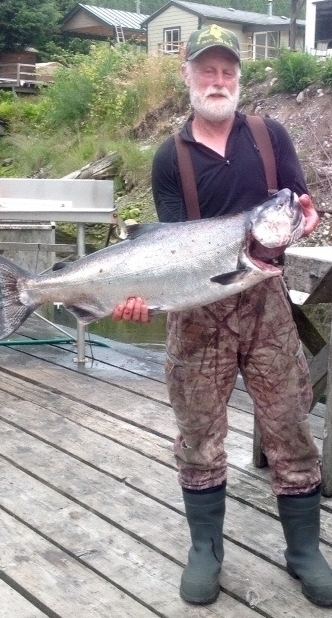 At Port Renfrew Marina Chinook fishing continues to be very good just about everywhere. Small springs and Coho are a bit of a problem making it hard to keep your bait in the water for very long. Offshore the weather has calmed down to basically flat seas making the trip out and back enjoyable. Halibut, Chinook and Coho are all being caught in good numbers. Lots of bait around, krill and herring are attracting all sorts of sea life. It's a great thing when you look on the docks and everyone is bringing fish to the cleaning tables and in nice sizes, most in the mid twenties. Crabbing seems to have slowed down a little, still being caught but not quite in the same numbers. We at Port Renfrew Marina want to give a huge thank you to Stan Robertson and some friends who volunteered their time to extend the boat launch with concrete so fishermen could launch their boats even at low tide. This was done strictly by his and their own doing and and out of their own kindness. Over the years we have been lucky enough to have this kind of loyal and great customers who do these kinds of things on their own and happily. At Port Renfrew Marina we have a new raffle item that has been very generously donated by one of our long time customers, Lorelei Green. She is an amazing artist somewhat reminiscent of a famous painter by the name of M. C. Escher. The watercolor she has donated is called Seaside Adventures and comes framed and matted. This painting has to be seen to really appreciate the depth and subtle colors and textures. It's value is estimated at $650.00. We are selling tickets at the marina for $5.00 each or 3 for $10.00. The painting can be viewed in the office at the marina and the draw will be made on Sept. 2nd the final day of our annual Labor Day Derby. All monies raised will go to salmon enhancement. Seaside Adventures painted in watercolor-dry brush by Lorelei Green. Upcoming Events: Coming soon on July 21st and 22nd Port Renfrew Marina will be hosting the 4th annual Kinsmen Salmon Derby. We can't really say enough about this derby, it is put together completely by volunteers and the monies raised go to a variety of wonderful causes. The derby has grown quickly in popularity for its amazing prizes and the overall fun and enthusiasm by the people running it and the participants. Come out and support the derby for its causes and have some fun catching fish. Tickets are $50.00 a rod. Go to www.lakecowichankinsmen.com for more details. At Port Renfrew Marina we will holding our annual 21st Labor Day derby on Sept.1st. and Sept.2nd. Most everyone knows how this derby is done but for those who are new to this it is a 2 day derby with a PRM t-shirt, a dinner with beverages on the Sunday and a live band Sunday night. The monies raised at this derby go to salmon enhancement, both the local San Juan Hatchery and also the Sooke Chinook Enhancement Initiative. More details to come. Regarding the derby, we asked now that if anyone has a business or knows of one or an individual who would care to donate to this derby please contact us at the marina office. All donations gratefully accepted and acknowledged both at the marina and on our website.